Bhai Swaran Singh Granthi was born in the house of Sardar Gurmukh Singh and from the womb of Mata Harbans Kaur in the year of 1971 in the village of Kalian Sakatran, district Amritsar. Bhai Sahib was youngest of 3 brothers, Bhai Balvir Singh, Bhai Bhala Singh, Bhai Nirmal Singh and 4 sisters, Bibi Joginder Kaur, Bibi Gurmeet Kaur, Bibi Bhajan Kaur, Bibi Surjit Kaur. Bhai Sahib studied until 5th class at the local school of Kalian Sakatran, then until 8th class in a school of village Dhul, then 10th class in village Bhure and finally passing his 12th class from a school in village Khemkaran. After passing 12th class, Bhai Sahib went to the village of Pugay near Jalalabad, district Ferozpur to live with his Bhua. Bhai Sahib’s Fufar was Giani Dyal Singh from whom Bhai Sahib completed his Gurbani Santhaya and learnt Katha. Then in 1985, Bhai Sahib went to Sri Mukhatsar with his Fufar and was blessed with Amrit by the Panj Pyare. From here Bhai Sahib started his Gursikh jeevan. Giani Dyal Singh held deep knowledge in Hinduism, Islam and Christianity as well as Sikhi. Bhai Sahib was also taught how to read and understand Geeta, Ramayan, the 4 Vedas, Quran Sharif and The Holy Bible. Bhai Sahib had gained so much knowledge and could now discuss any issues with scholars of other faiths. Bhai Sahib worked for one year in a factory of Ludhiana. The owner of the factory was a practising Christian and the atmosphere of the factory was aligned with Christianity. The female preachers of Christianity are called Mother and some of the Mothers worked at this factory. These female workers would love talking to Bhai Sahib about religion. Everyone knew Bhai Sahib held great amount of knowledge on all faiths and for this reason the Christians tried to persuade Bhai Sahib to go to America to join the Christian preachers there. The Christians were willing to pay for Bhai Sahib’s ticket to America to become a Christian preacher. Bhai Sahib was promised a good job with a great salary and all the needs of life would be fulfilled. The female preachers who worked with Bhai Sahib even took the responsibility to arrange for Bhai Sahib to be married and a house, car with servants will be provided. The study of Bhai Sahib’s children will be at a top school and paid for. Little did these Christians know that Sikhi is attained by giving your head, not by money. Bhai Sahib answered the Christians by saying, “A man can be wrong but Akaalpurakh Waheguru can’t be wrong. Whichever religion we are born in, we should follow that religion. Why should I leave Sikhi to become a preacher of Christianity?” After working in Ludhiana for a year Bhai Sahib came back to his village in Kalian Sakatran and did sewa at the local Gurdwara as Granthi and for a short while during this time worked at the local post office. When the news of the June 1984 attack on Sri Darbar Sahib came on the national radio, 5 singhs from Kalian Sakatran got on to the path to Amritsar. The 5 singhs were Bhai Sahib, his older brother Bhai Balvir Singh, Bhai Akbar Singh, Bhai Mukhtiar Singh and Bhai Bageecha Singh Khalsa. When the singhs reached the Bir Baba Budha Sahib Gate on GT Road, they saw a heavy presence of Indian army. Thousands of Sikhs were being discriminated and being made to turn back. At that time the singhs were unarmed and that was the reason they also returned back home. The singhs had sworn to live and die as guardians of Sikhi. Singhs who returned back did not rest at home. Singhs were getting hold of weapons from anywhere and punishing the Indian officials who were out hunting for Sikhs. Thousands of Sikh youths entered the battlefield not being afraid of death. When the sun would set in the evening, the Sikh youth would get together in their villages, where they would discuss the strategy of the movement and share panthic duties amongst them. It was amongst this Sikh youth the likes of Bhai Pipal Singh Toofan, Bhai Anar Singh Para, Bhai Swaran Singh Granthi, Bhai Akbar Singh, Bhai Bageecha Singh Khalsa, Bhai Virsa Singh, Bhai Sukhdev Singh, Bhai Gurmukh Singh, Bhai Shinder Singh, Bhai Sardool Singh, Bhai Jarnail Singh, Bhai Raj Singh, Bhai Satnam Singh, Bhai Shinda Singh, Bhai Sahib Singh, Bhai Shalwinder Singh, Bhai Kewal Singh Duhal Kohna, Dr Surjit Singh Jhakkar, Bhai Jaskaran Singh Kala, Bhai Rasal Singh Thathi Jaimal Singh, Bhai Joga Singh, Bhai Gurnam Singh and Bhai Saraj Singh Thathi Jaimal Singh were causing heavy damage to the government of India. If we look at the newspapers of that time, we can notice that most of the actions in this area had the name of this group written with it, actions such as attacks on army bases, CRPF checkpoints and assassination of Indian officials. In the encounter of Jhabal, Bhai Jaskaran Singh Kala, Bhai Amarjit Singh Amba and Bhai Sahib were surrounded by Punjab police and CRPF. Bhai Kala told Bhai Sahib, “Swaran Singh, I will fight till my last bullet is fired with Bhai Amba, our time of martyrdom has come. It is not easy to escape from here. Swaran Singh, for your safe pass out of here, you have post office papers. These papers will help you, use these papers to escape from here as after our shaheedi you will be taking command of this group and you must continue this struggle.” after listening to his soldier brother, Bhai Sahib was sent into a house. Thousands of Indian security forces soldiers had started the battle against the 2 singhs of Guru Gobind Singh Ji Maharaj, which lasted for many hours. In the end Bhai Jaskaran Singh Kala and Bhai Amarjit Singh Amba attained shaheedi in this fierce encounter. After the encounter the Indian security forces didn’t bother searching the village as little kids were making a mockery of the Indian soldiers who in their thousands could manage to arrest 2 singhs. After the shaheedi of Bhai Jaskaran Singh Kala, the rank of Area Commander was given to Bhai Sahib. All the responsibilities of the group were now on the shoulders of Bhai Sahib. 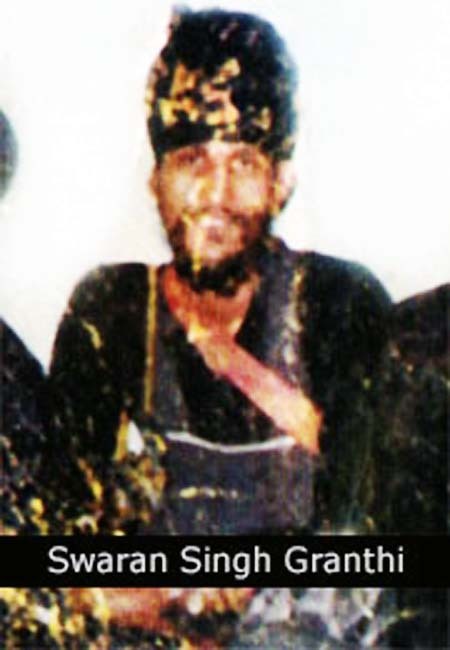 Bhai Sahib did sewa under Bhai Wassan Singh Zaffarwal’s Khalistan Commando Force. Later looking at Bhai Sahib’s contribution he was given the rank of Lt General of Khalistan Commando Force. During this time Bhai Sahib’s group had the likes of Bhai Rasal Singh Thathi Jaimal Singh, Bhai Surjit Singh Jhakkar, Dr Harbans Singh Dholan (He was a senior doctor at a mental hospital), Bhai Jaimal Singh Fauji Dholan, Bhai Bageecha Singh Khalsa, Bhai Akbar Singh and Bhai Sukhdev Singh Sukha Kalian Sakatran. When crossing the border, Bhai Sahib would take of his shoes and do Ardas to Guru Maharaj for a safe passage. After doing the Ardas Bhai Sahib would take the lead and tell the fellow singhs to cross the border while reciting Waheguru Simran. On his return Bhai Sahib would do the same again. Bhai Sahib and Bhai Surjit Singh Jhakkar were staying at a rented house in the city of Amritsar and both singhs did duties of Sri Guru Granth Sahib Ji at Sri Akhand Paath Sahibs to not raise suspicion upon them. All the neighbours and the house owners thought the singhs were just normal Granthis. Bhai Sahib used the name of Ram Singh Granthi, while Bhai Surjit Singh Jhakkar lived under the name of Seetal Singh Granthi. Dr Harbans Singh Dholan would bring these singhs Langar to their house. One day as Dr Dholan was bringing these singhs Langar, he saw the Punjab police arresting both singhs on suspicion. Dr Dholan quickly ran to the police and said that he knows the singhs, they make a living out of doing duties at Sri Akhand Paath Sahib. The police searched the house and found nothing that contacted the singhs to the Sikh Freedom Movement, in fact they only found literature related to the faiths of the worlds which the singhs loved to read. The police arrested the singhs despite no proven relation to the movement and took them to a nearby police station. Fortunately the Panchayat of Kalian Sakatran had also come to Amritsar that day to buy Nishan Sahib materials for their Gurdwara. Dr Dholan met the Panchayat and explained what had happened to the singhs, and then everyone went to the police station where the singhs were being kept. The Panchayat vouched for the singhs and the police released them. All this was kept a secret from the village and due to that Bhai Sahib and Bhai Surjit Singh Jhakkar continued to live at the same rented use, so the police and the house owners would not get suspicious. Under the command of Bhai Sahib, Jhujaru Singhs blew up 2 jeeps that belonged to CRPF in Kalian Sakatran. All the Jhujaru Singhs managed to escape unharmed. BSF Headquarters in Noorwala near the border was the location of one of Bhai Sahib’s encounter with the enemy. It was in this encounter that Bhai Kewal Singh Duhal was shot in the arm. The BSF did not tell the public of their damage, but a milkman who delivered milk to the BSF base told to villagers that the singhs had killed many Indian soldiers and also had taken the weapons of the dead soldiers. Three jeeps belonging to CRPF were blown up with bombs in Taliyan Wala village. Bhai Sahib and fellow singhs escaped unharmed and remained in high spirits. Bhai Seetal Singh Jhakkar and Bhai Bageecha Singh Khalsa took the responsibility for this action. Bhai Sahib, Bhai Ajmer Singh Khara and Dr Harbans Singh Dholan went to the village of Makhu, district Ferozpur to punish a very big informant of the police. This informant had a gang and was supplied with weapons by the government for protection. Soon as the informant saw the singhs, they started firing at the singhs. In this fierce battle Dr Harbans Singh Dholan attained shaheedi. CRPF jeeps were blown up with bombs near the Amarkot village. It is said while the jeeps were exploding the singhs were heard shouting war cries of Bole So Nihal Sat Sri Akaal. The Indian soldiers called for backup, but the reinforcements never came because they were scared that the singhs might have plated bombs on the road and might blow their jeeps also. An informant of Ladhu village near Bhikhiwind had been warned not to go against the Jhujaru Singhs. After speaking to him, Bhai Sahib and fellow singhs were returning back. Singhs saw a crane dismantling a drain system near the border. Bhai Sahib told the driver of the crane to stop digging, but the driver ignored Bhai Sahib. The driver was pulled of the crane and Bhai Sahib planted bombs under the crane and blew it into pieces. Bhai Sahib told the driver, “We could kill you, but we will spare your life as you’re needed by your family to feed them. When the next crane comes the driver of that crane would think twice about digging here.” The driver was stood still shivering from fear. The driver had only been reading anti-Jhujaru articles in Jagbani newspaper, but when he saw the Jhujaru Singhs in real life, he had wet his pants. This was the kindness of the Jhujaru Singhs that they spared the life of the driver. Bhai Sahib, Bhai Rasal Singh Thathi Jaimal Singh, Bhai Ajmer Singh Khara, Bhai Jaimal Singh Dholan were returning from a delivery of weapons to other Jhujaru Singhs. When they reached the village of Ladhu, they decided to rest in the farms as the sun rose to give the world its light. The Punjab police soon received this information, it could have been that an informant had been following the singhs from earlier. It was on 13th September 1990 at 03:40am when the informant reached the Bhikhiwind police station and reported the location of the 4 singhs in the village of Ladhu. Bhai Rasal Singh Thathi Jaimal Singh and Bhai Jaimal Singh Dholan managed to escape. It was these singhs who informed Bhai Sahib’s family of the martyrdom of the singhs. 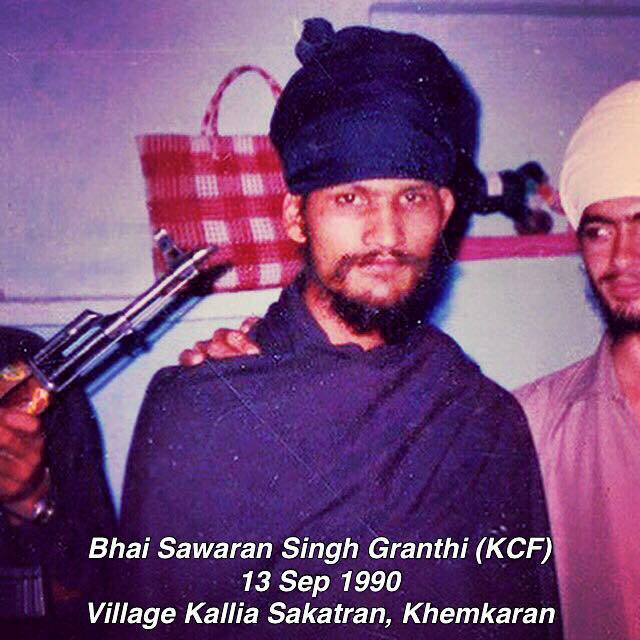 On 15th September 1990, the Granthi Singh from the Gurdwara of Kalian Sakatran announced, “Guru Roop Saadh Sangat Ji, it is with great regret I have to inform you that Bhai Swaran Singh Granthi and Bhai Ajmer Singh Khara have attained shaheedi in a fierce encounter with the CROF in the village of Ladhu.” After listening to this, the whole village gathered at the Gurdwara. In tractor trollies villagers and Panchayat reached the government hospital in Patti where a post-mortem was being done on the singhs. Even after the Panchayat spoke to the police, the bodies of the singhs were not given to the families for cremation. On 24th September 1990, Sri Akhand Paath Sahib Bhog was done for the chardikala of the Shaheed Bhai Swaran Singh Granthi and Shaheed Bhai Ajmer Singh Khara at the Gurdwara of Kalian Sakatran. On this day the CRPF searched every single house of the village. Thousands of Sikhs attended the Ardas of Bhog and paid their tributes to the fallen soldiers of Guru Gobind Singh Ji Maharaj. Baba Daya Singh Ji, Jathedar of Bidhi Chand Nihang Dal and Simranjit Singh Mann also attended this smagam and gave a Saropa to the families. Unlimited amount of Jalebi, Kheer, Tea and Milk was served in the Langar.